We wouldn’t blame you if you’re attracted to all that the 2016 Alfa Romeo 4C Spider can offer, including the incredible performance and unmatched luxury. However, you might be unaware that there are several ways that owners can customize their vehicle and truly make it their own! The brand allows drivers to choose from a number of exterior, interior, wheel, and package offerings, and opting for any of these offerings will certainly make your new 4C Spider unique. Next, there are a number of exterior features that customers can opt for that can improve the entire driving experience. For instance, the bi-xenon headlamps provide drivers with optimal visibility on those dark and stormy nights, and they’ll also alert fellow drivers of your presence. The carbon fiber halo and racing tuned exhaust will provide an extra bit of sportiness (although the Spider is already plenty athletic), while the satin exterior mirrors will add a bit of elegance to your car. Finally, drivers can opt to include the Pirelli P Zero AR Racing Three-Season Tires to their vehicle. This inclusion will provide drivers with optimal traction, regardless of the season. These tires can only be added to a Spider that’s equipped with the 18-inch front/19-inch rear silver forged five-hole wheels. While the 2016 Alfa Romeo 4C Spider is already plenty luxurious, these various leather options will elevate it to a whole new level! 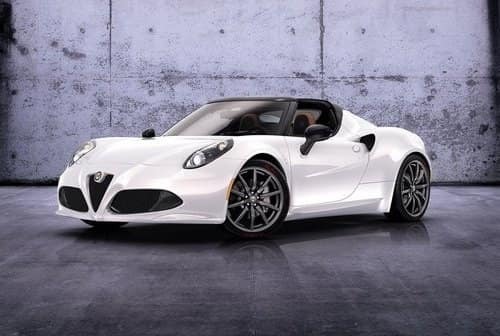 Predictably, Alfa Romeo also provides their customers with an opportunity to add specific packages to their 4C Spider. These various offerings can boost style, convenience, and performance! The Spider Convenience Group includes a number of amenities that are intended to help drivers avoid accidents or fender benders. The Cruise Control will allow drivers to take a brief break while driving, as the vehicle can consistently maintain a pre-set speed. Meanwhile, the Park Sense Rear Park Assist System will help the driver monitor anything that’s happening behind the Spider. Thanks to this inclusion, drivers will be able to avoid pesky fender benders or accidental collisions. Meanwhile, the Spider Track Package revamps the exterior to make it even more sporty than it already is. The race tuned suspension will help improve overall performance, including control and handling. Meanwhile, the carbon fiber mirrors will add a bit more style to your exterior thanks to the unique color. It’s important to note that this package is only available when the vehicle is equipped with specific wheels (17-inch front/18-inch rear dark alloy wheels, 18-inch front/19-inch rear silver forged five-hole wheels,18-inch front/19-inch rear light alloy fan spoke wheels, 18-inch front/19-inch rear dark alloy fan spoke wheels, 18-inch front/19-inch rear dark gray forged five-hole wheels). If customers truly want to embrace the material used on the previous package’s mirrors, they can pursue the Carbon Fiber Interior Trim. By opting for this package, customers will see a variety of amenities being adorned in this material, including the cluster bezel, gear shift, IP trim, and air vents. Finally, the Spider Track Package N/A with Tobacco Leather or Giallo Prototipo Paint adds a number of mechanical and cosmetic features to the vehicle, including a race tuned suspension, carbon fiber mirrors, and a microfiber/leather steering wheel with red accent stitching. Similar to the Track Package, this offering can only be opted for if the Spider is equipped with specific wheels (17-inch front/18-inch rear dark alloy wheels, 18-inch front/19-inch rear silver forged five-hole wheels,18-inch front/19-inch rear light alloy fan spoke wheels, 18-inch front/19-inch rear dark alloy fan spoke wheels, 18-inch front/19-inch rear dark gray forged five-hole wheels). The brand also offers a pair of accessories that could prove to be useful throughout your ownership of the vehicle. Drivers can opt for both the battery tender and car cover, which could prove to be invaluable in certain situations.